with clear communication and integrity. We celebrate the milestones of being more than two decades strong in business; with second generation ownership reaching a 10th anniversary in 2016! Jason grew up in the Seattle area. He comes from a long line of contractors and craftsman. He grew up working construction alongside his father Jason G Jarman. Jason has a Bachelors Degree in Architecture and a Masters Degree in Construction Management from the University of Washington. He worked as a carpenter early in his career and then as a purchasing agent for a local home builder, Murray Franklyn. He later managed the company’s customer service department. Jason left Murray Franklyn to assist in the start-up and operation of a new and exciting local builder, The Dwelling Company. Jason ran multi-million dollar projects as a project manager and partner. His expertise in design, customer care, and cost/budget control as well as his long term relationship with many of the best local subcontractors helped him be an integral part of The Dwelling Company’s success. In 2004 Jason started Sunstone Homes and merged with Rainier Custom Homes in 2006. Michael grew up in the Seattle area. He has had the opportunity to work in the construction industry most of his life. First, early on, while helping his Dad, Jason G Jarman, start and grow Rainier Custom Homes. Then, from 2006–2010 Michael worked for several companies deftly managing sales and marketing; developing strategies and training programs. 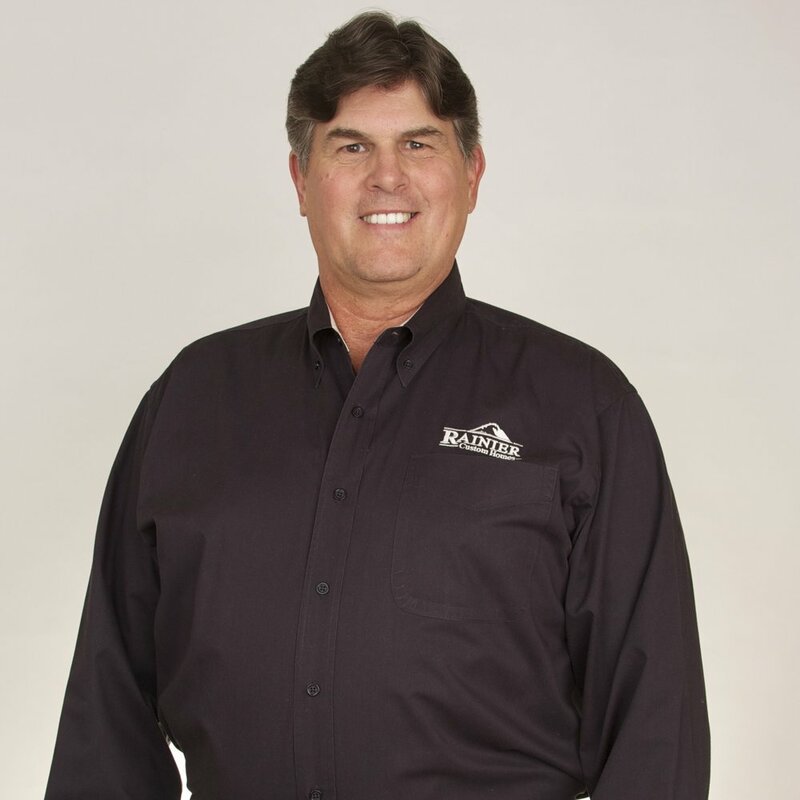 Michael received his Bachelors Degree in Construction Management from Brigham Young University in 2010. Upon graduation he joined his Dad and Brother here at Rainier Custom Homes. Today, Michael is one of the first people that you will meet with, to discuss your build project. Jason grew up in Utah. He worked alongside his father as a journeyman iron worker installing steel in large commercial and civil projects such as dams and bridges. He later started a family owned business, Mer-Can Manufacturing wherein, he oversaw the assembly, packaging and the shipping of the wood burning appliance line. He was also involved in all research, development and patenting of products, as well as running all display booths in national hardware shows. He later worked as general tradesman for a local General Contractor doing all phases of remodel work as well as some new construction. In 1994 he started Rainier Custom Homes. Today, Jason considers a successful construction project standard to include kind hearted and warm relationships between himself and clients. Originally from Northern California, Adin moved to Seattle in 2001 and joined the RCH team in early 2014. He brings over 20 years of hands on experience building high-end residential projects. Adin first started building and remodeling custom homes in 1993 working as a framing carpenter, a finish carpenter and then a lead carpenter. In 2004 his position continued to advance to that of a site superintendent. In addition to fieldwork, he earned a degree in Construction Management, from Edmonds Community College, in 2008. Adin is credited with the successful completion of several complex luxury homes designed by respected local architects and designers which feature both traditional and modern design aesthetics. After several years working as a project manager, today, Adin’s mission as Chief of Operations, is to oversee your project with the highest standards and quality, while ensuring clear communication and integrity. Adin’s strong management skills combined with his hands on expertise results in client satisfaction down to the smallest of details. Steve was born and raised in Northern California. There he raised live stock and managed a 3000 tree apple orchard with his father until he enlisted in the US Naval Submarine Service in 1984. While still in the Navy, Steve launched his own construction company, Dutch Built Construction. In 1992 Steve was honorably discharged from Naval service allowing him to focus his energies toward expanding his own company. In 2005 Dutch Built Construction merged with another company and became RESCOM Developers, Inc. In 2007 Steve’s oldest daughter experienced some serious health challenges so he sold his interests in RESCOM which had expanded to 33 states. His daughter is now doing great. Since 2009, Steve has played a major roll in the successful growth and expansion of three other companies as a senior executive. In January of 2018 Steve was hired by Rainier Custom Homes as Senior Vice President with the plan for him to run the company in the future. By September of 2018 Steve was promoted to CEO here at Rainier Custom Homes. Steve’s mission as CEO is to carry forward and expand the Remarkable culture and quality custom home construction experience created by the Jarman Family for their team and their clients over the past 25 years.